Showtime teases Sacha Baron Cohen's new project with posters asking Who Is America? 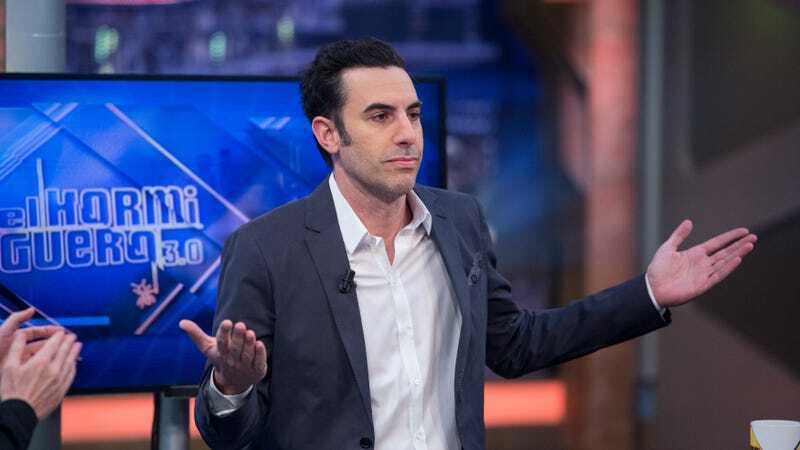 Last week, Sacha Baron Cohen and Showtime began teasing a new project that would reportedly involve the Borat mastermind returning to his Da Ali G Show roots for another prank-based interview series dedicated to mocking Donald Trump and—presumably—the dummies who support him. That’s about all we knew, since Showtime and Baron Cohen are being very secretive about all of this, but Vulture recently found some posters in Brooklyn that seem to be giving us a bit more info. For starters, it looks like the show will be called Who Is America?, and the posters show Baron Cohen wearing different kinds of eyewear peeking out from behind an American flag. These are probably glimpses of the characters he’ll be playing in the show, but without any other information it’s impossible to really predict what’s going on. We’re going to guess that at least one of the characters will be kind of frustratingly ignorant in a way that makes other frustratingly ignorant people feel superior and therefore makes them more likely to fall into a trap and expose how ignorant they are, but we’re not really basing that on anything in particular. Anyway, the posters also say “you’ve been warned” and tease that the show will air on Sunday nights, with Vulture adding that Who Is America? (if that’s really the name) will premiere on July 15. These Recommended Stories are pretty nice! My spouse!